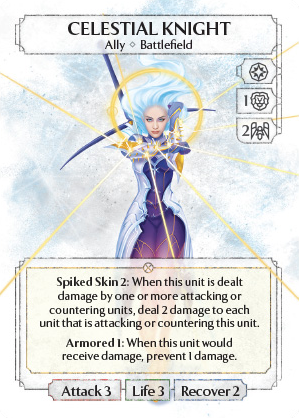 Spiked Skin 2: When this unit is dealt damage by one or more attacking or countering units, deal 2 damage to each unit that is attacking or countering this unit. This Unit dies if attacked by a NightShade Swallow because Nightshade triggers on 'deal damage' while Armored 1 triggers on 'recieved damage'. Deal Damage is resolved first so Deathstrike is resolved before Armored 1 is.